As I walked into church last Sunday, I was hit by the social buzz that accompanies mission farewells. The chapel was filled to about twice the normal capacity with youth in the 16-21 year-old demographic, anxious to hear their friend speak, partake in the social gathering, feel validated in missing their regular ward meetings, and hopefully get fed a good meal afterward. They filled in the seats all around my family, and before skirts and slacks even hit the seats, cell phones were out and in full surfing/texting mode. I was mildly amused until the guy next to me dumped half the water tray in my lap as he was unsuccessful in texting with one hand and passing the tray in a level, upright position to me with the other hand. At that point I felt the spiritual disappointment for the lack of appreciation for a sacred symbol that I had looked forward to all week. I felt the disgust with his lack of courtesy in respecting my right to worship. I felt ashamed for his device addiction that didn't allow him to hear a great meeting or feel a special spirit. And I felt embarrassed to be feeling all of this while I should be focusing on the sacrifice of my Savior and the continued blessings of his gospel in my life. As the sacrament concluded, my five year-old daughter came to sit on my lap, and gently asked if she could play with my phone. We live in an age that playing who can put your hand over your siblings hand game, drawing in a coloring book, or tracing your hand on the back of the program have been surpassed by free downloads of all kinds. Horse puzzles, interesting kids games (including bible-themed), and many others now have an amazing effect on keeping my squirming children quiet for the duration of the meeting. Step 1, make sure the phone is muted, step 2, sit back and focus on whatever un-kid related activity you want to for the meeting. It's that simple. Except for the fact that uncomfortable thoughts hit in those times, and one hit me. "I am conditioning the exact behavior that I am condemning," I thought. "I'm taking the easy road, letting an electronic device entertain her, depriving her of learning reverence, paying attention, occasionally navigating the weird, the boring, or possibly the inspiring discourse given." 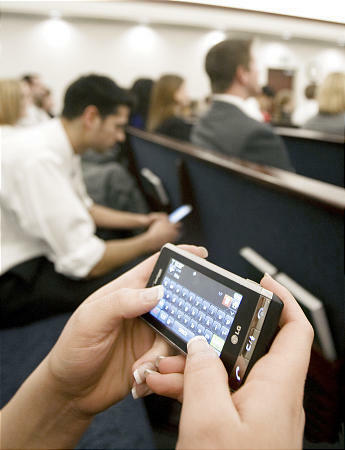 I grew up without a phone in meetings, but still have to fight the urge to check a sports ticker, or venture beyond my Gospel Library app on my phone. However, allowing my kids to learn that behavior from a young age leaves little hope for them and conditions them to use sacred time for entertainment time. It reflects poorly on my stewardship as a father. This reflection activity has led me in a careful self-analysis of my teaching, particularly during worship services. While it may be harder to go back to squirming, occasional boredom, or even apathy, I may also get back to helping my children to learn from a gospel that teaches endurance, perseverance, and work-to-learn mentality. Not easy, but I hope worth it.